Online betting site Bethard has announced that they’ve signed a content deal with Relax Gaming and will begin offering the company’s blackjack title on their casinos as a result. The agreement will see all of Bethard’s gaming channels offering both blackjack and roulette games from Relax. The company’s brands include Bethard SuomiVegas, SverigeCasino, and SverigeKronan. Relax’s blackjack game is a hot product, having recently been launched and offering up to three hands at once. The game is sharp in its presentation, allowing it to be played on mobile and desktop devices. Gaming groups Intertops Poker and Juicy Stakes Casno have announced that they’ve launched a new blackjack and video poker promotion, which will let players earn points to win large cash prizes. Players who play at either site and land a Natural Blackjack will get one point. Players who get a blackjack with both cards being a Diamond will earn 20 points, while a Big Suite 21 (A, 2, 3, 4, 5, 6) will get 300 points. Points will be accumulated from December 6th through the 12th, with the 30 highest players getting money. The prize pool is $2,000, with first place getting $300. Those who win will have a 15x payout on their prize before they can cash out. Punters can also qualify via video poker, with Two Pairs getting a point, while a Flush gets you 20 points and a Royal Flush getting you 300 points. This week a punter took home a huge blackjack jackpot at Grosvenor Casino in the Merchant City Casino in Glasgow. The big win was worth £73,887 and came when he hit the winning combination on an Ace King suited table games. The big hit comes just a week after another player hit the same jackpot for £53,000. Over the past few years, ten other punters have hit the prize for £105,000. Grosvenor Merchant City is located on a riverboat and includes table games, slot machines, and also boasts a restaurant. This week Intertops Poker and Juicy Stakes Casino announced that they’re offering an exclusive blackjack bonus to customers this week, allowing them to earn free blackjack hands when they score a specific set of rules. On September 29th players who score five natural blackjacks at the casinos will be granted a complimentary blackjack hand. Those who get a same suit blackjack will be granted three free hands. A Small Suite 21 (6,7, and 8) will net players five free hands. Players will be able to win up to $250 on the free hands they earn, with a 15x rollover attached for the winnings. Intertops is known for offering a sportsbook and casino as well as poker room to players. The company has been in operation for more than 30 years, having been online for the past 20 or so. Those interested in learning more can do so here. The company also announced that they’re also hosting a poker tournament and sending the winner to the Aussie Millions poker tournament in Australia. Both casinos offer a variety of different blackjack bonuses to players and we’ll be adding more stories as we learn about new ways for blackjack players to take advantage. Internet casinos Juicy Stakes and Intertops Poker have announced that they’ll be boosting all blackjack wins by 5% from 7:00pm to 10:00pm EST this Friday. The deal mimics other blackjack promotions put out by the company in the past. Players participating in the promotion will face a maximum $250 benefit from the promotion. The deal is good on the games Double Draw Blackjack, Perfect Pairs Blackjack, and more. Additional terms can be found at the respective websites. Pennsylvania land casino Sands Bethlehem has announced that they’re adding live dealer blackjack stadium games to their property, bringing live dealer action to more players. The game allows for more people to partake in blackjack games through the same live dealer technology used by online gamblers. Players sit at terminals and place bets via a touchscreen. Cards are then dealt on tables and players can make decisions to hit, stand, split, double down, or take insurance through the screen. The games also let players play on more than one table at once. The games are proving to be popular options for casinos, as they allow more punters onto tables with fewer actual tables and dealers. With the addition, Sands Bethlehem is the largest Electronic Table Games casino in the United States. Scientific Games has launched a new land casino product called ‘Stadium Blackjack’ at casinos in Nevada, and the game has proven to be a hit among those that have given it a try. 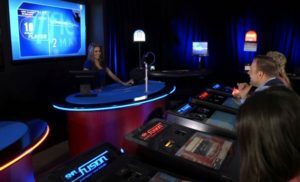 The game has a live blackjack dealer table that’s cards are played out and displayed on terminals seated in the area, where players can make their wagers and bets right on the screen. The game is then played out and the results are paid out. Since its launch at the Venetian earlier this year the game has proven to be popular among players, who are able to access the game with lower limits and participate in larger numbers, where table spots can be hard to come by. Right now the game is still being deployed at casinos and the title can also be found at the Palazzo, which is part of the same property set. The game’s rules aren’t spectacular as it has a 6:5 payout. Have you had a chance to play Stadium Blackjack? If so, what have your experiences been? Today the state of Florida and the Seminole Native American tribe announced that they’ve come to an agreement on a new compact that will see the tribe getting exclusive rights to blackjack games in exchange for $340 million in payments to the state annually. The agreement ends a dispute that’s been raging for years between the two parties, and will bring both groups satisfaction. The tribe will pay $340 million annually for the next 13 years and will have exclusive rights to shoe games at their casinos. A previous dispute between the groups arose when the state began allowing outside groups the chance to offer electronic versions of shoe games at establishments. The tribe ceased payments to the state but continued offering the games, citing the breach in contract as their reason. A federal court judge agreed, and Florida vowed to appeal the case to the Supreme Court if necessary. Now it appears as though that won’t be necessary moving forward. This Friday both Intertops Poker and Juicy Stakes are offering free blackjack hands for every ten hands played at either site. The promotion will go from 7:00pm through 10:00pm Eastern time and will see players getting a free hand of blackjack for every ten hands played. The value of the free hand will be averaged over the course of the ten previous hands played. Winnings on those hands will be subject to a 15x playthrough before they can be cashed out. The deal appears to be good for several types of blackjack on both sites, but it should be noted that blackjack games in the standard Intertops casino are not eligible for the promotion. You must play at Intertops Poker of Juicy Stakes to get in on the action. A woman from Long Beach Mississippi was arrested this week for cheating at Blackjack at the Scarlet Pearl Casino and now she is being charged for violating a state law related to gambling. She was taken into custody and given a bond of $5,000, 10 percent of which must be paid to leave jail. She is being charged with a felony and could serve years in prison if convicted.